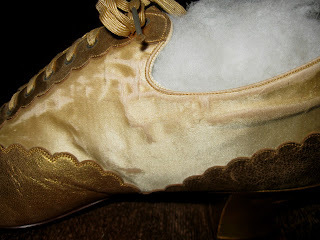 For your bidding consideration today, we have a stunning pair of antique Victorian lace up shoes. These shoes are made of gold metallic leather and cream silk fabric. 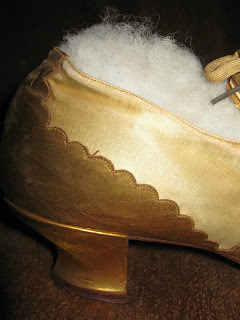 The toe area, the backs of the shoes, the heel, and the area along the eyelets are all made of the gold leather. The rest of the shoe is made of creamy silk. All of the edges of the gold leather are scalloped, and the metal tips are all present on the tips of the laces. 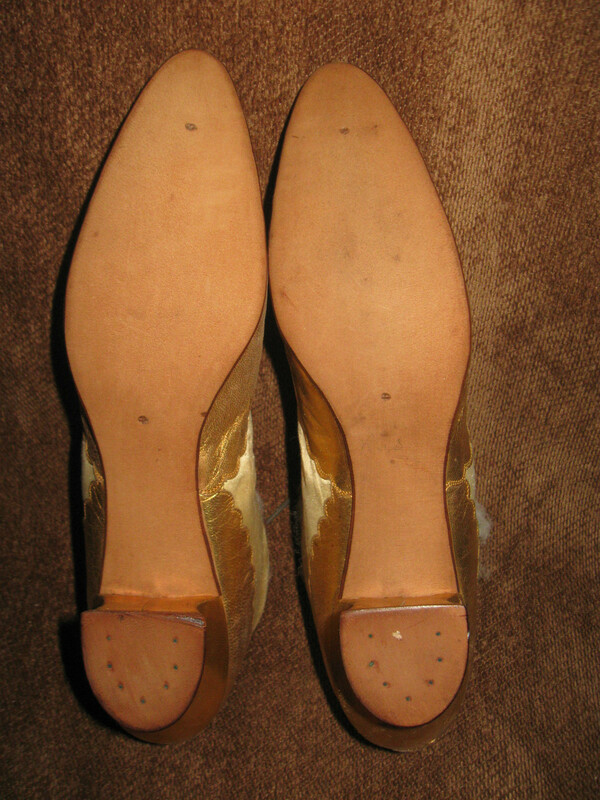 The leather soles have no wear, so I don't know if these were even worn. They are simply stunning !!! Condition wise, as lovely as these are, there are some issues with the silk. As you can see from the pictures, there is some splitting and wear on both shoes on the silk section. 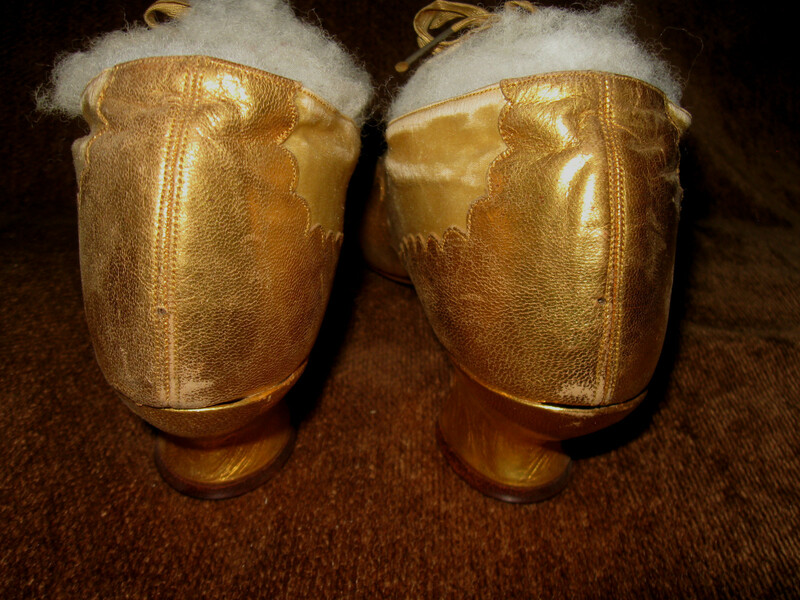 The gold leather is in very nice condition, with very minor flaws. Even with the condition of the silk, these are a stunning pair of elegant and fancy Victorian shoes that would compliment any collection. Have you ever seen a pair like this????? As with all shoes of the era, these do not have a size in them, so please do not ask me to guess what size they are, I don't know, and I don't want to guess, so I have provided the following measurements so that you may decide if these would work for you. When placed up against a wall, and measured from the outside, where the heel of your foot would sit, to the tip of the toe, they measure inches long, and the width of the sole at the widest part is a little over inches . Please do not ask me to remove the stuffing to get an interior measurement. The shoes have been stuffed for years, and I do not want to remove it. 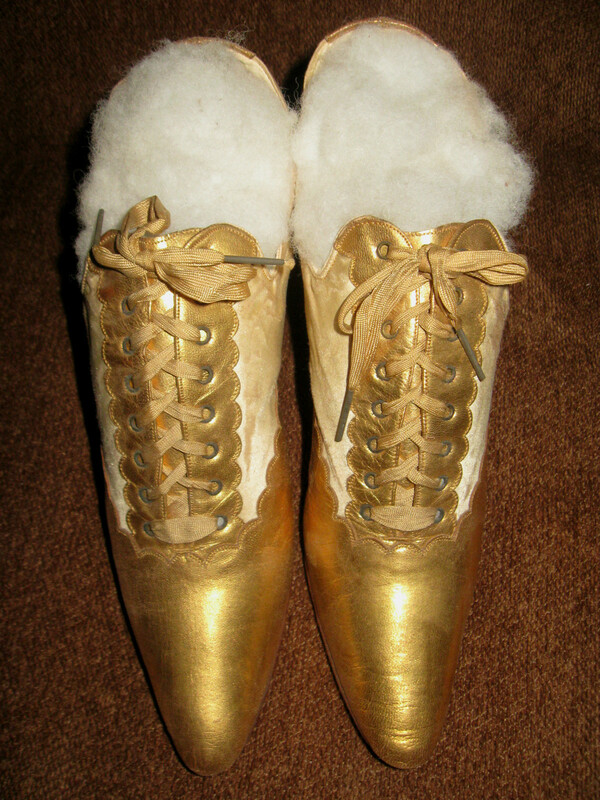 I've seen similar styled shoes from the 1910's/1920's but I really don't know. If anyone else has a better idea of when these are from, please, let me know!